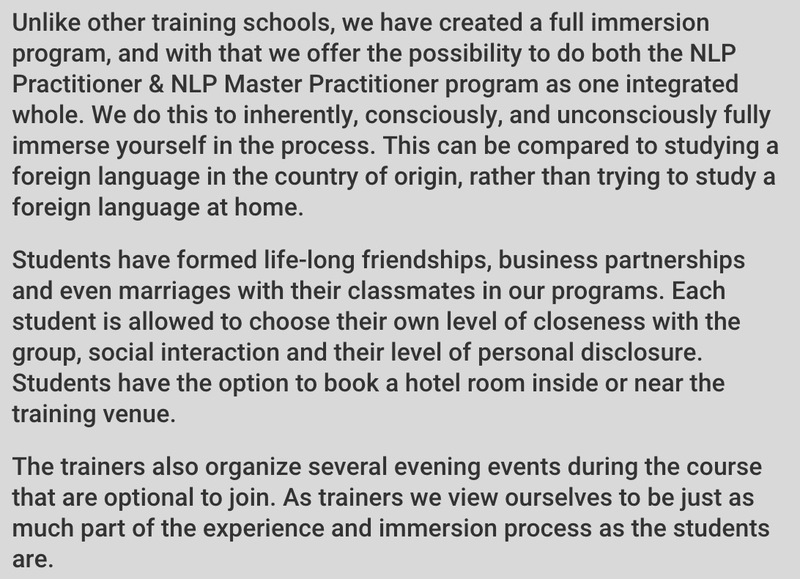 NLP Training in Amsterdam (The Netherlands) in an international immersion training with students from the around the world. 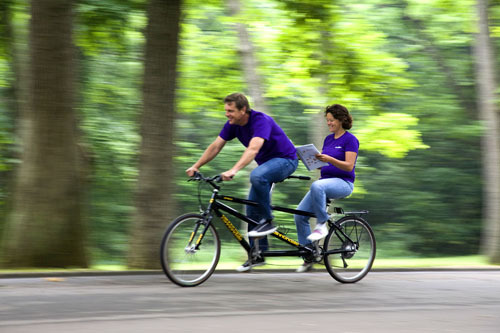 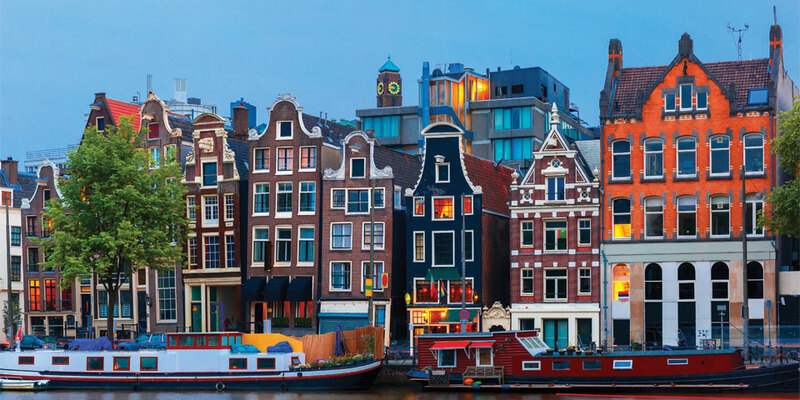 Our NLP Training in Amsterdam is held in the English language, for both native speakers as well as people with English as a second language. 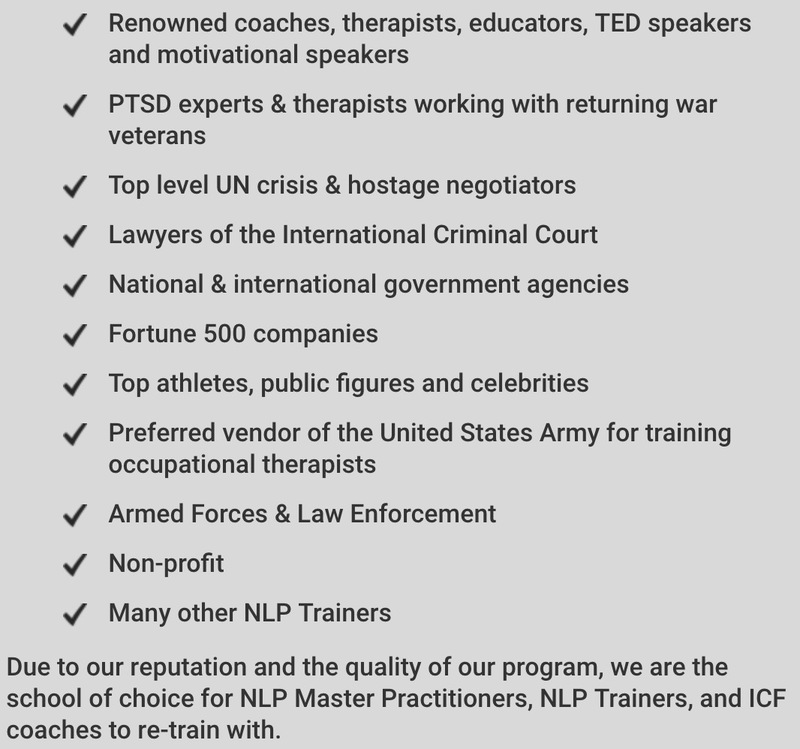 We have an international track record unparalleled by any other NLP Training company and coaching certification company operating in the Netherlands. 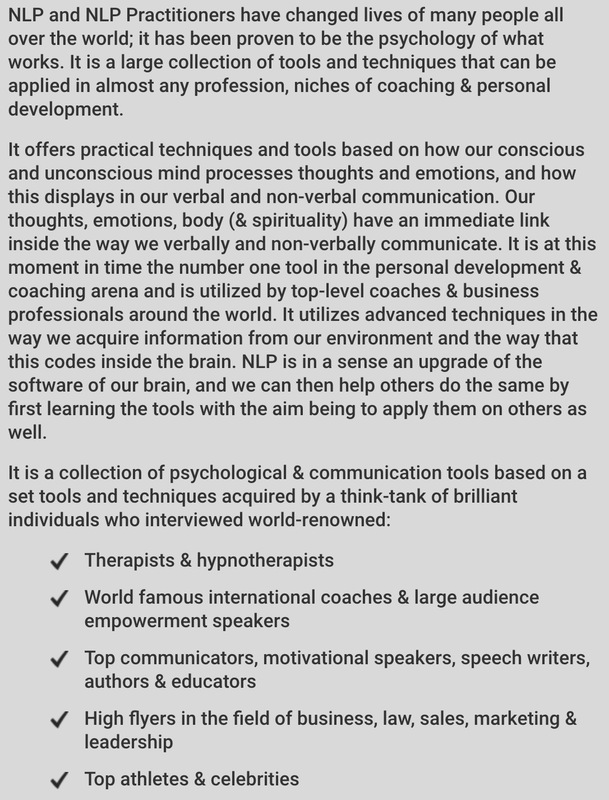 We offer small size international classes and students have the option to do NLP Practitioner & Motivational coaching immediately followed by NLP Master Practitioner & Life Coaching/Emotional Intelligence Coaching. 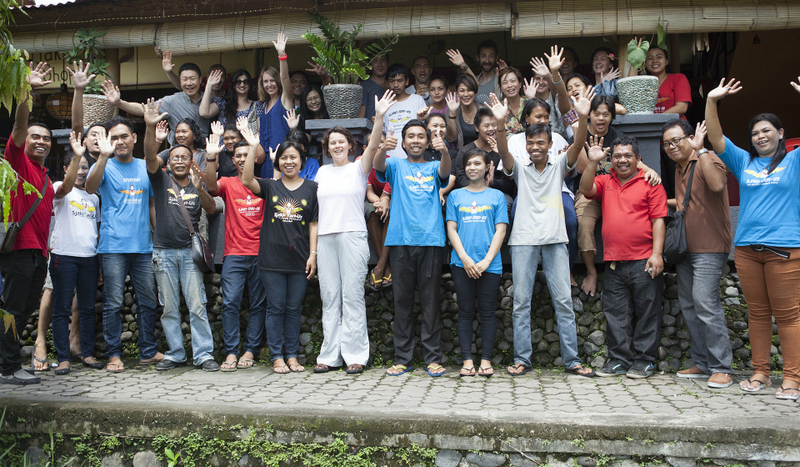 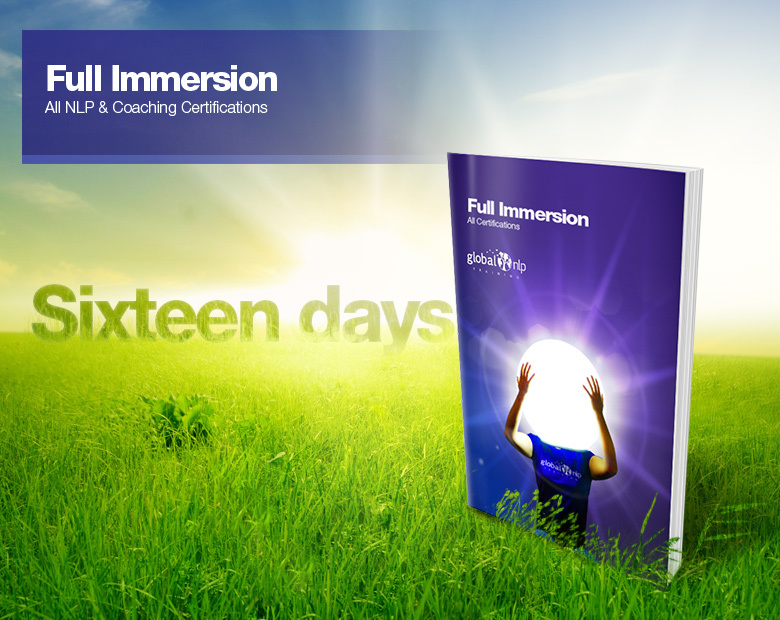 This means our training is a true immersion, and is offered as a fully experiential program with the aim that you can immediately apply NLP, coaching, NLP based positive psychology and advanced communication in any field. 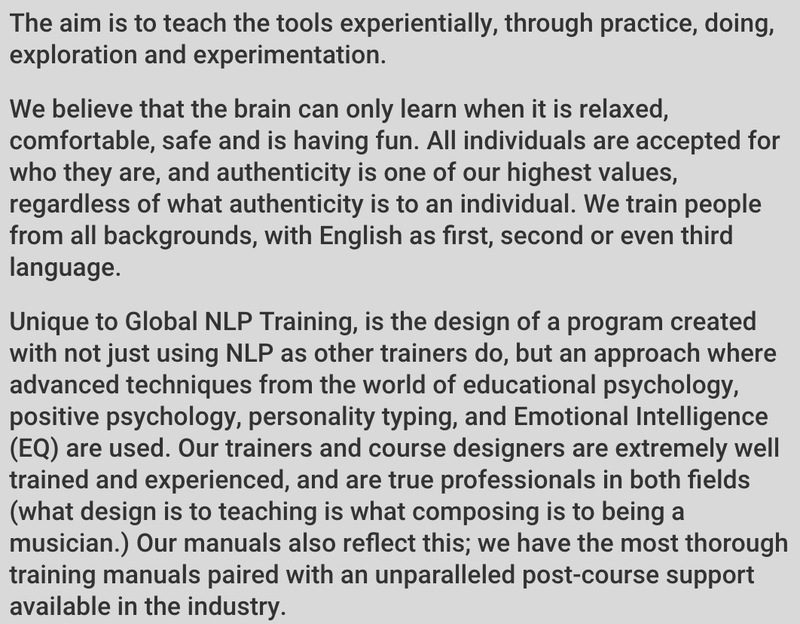 Better yet, we have trained NLP Practitioners & NLP Master Practitioners from all over the world who consider our classes a truly life changing experience. 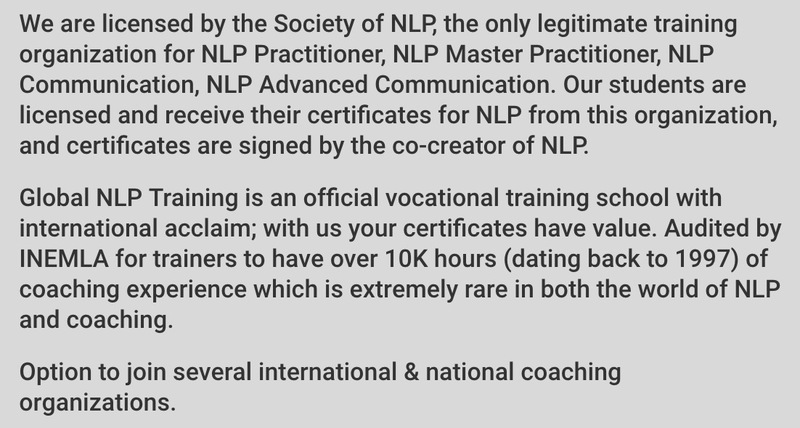 We are one of the few NLP Training companies in the European Union, registered as an official Vocational Training School (CRKBO.) 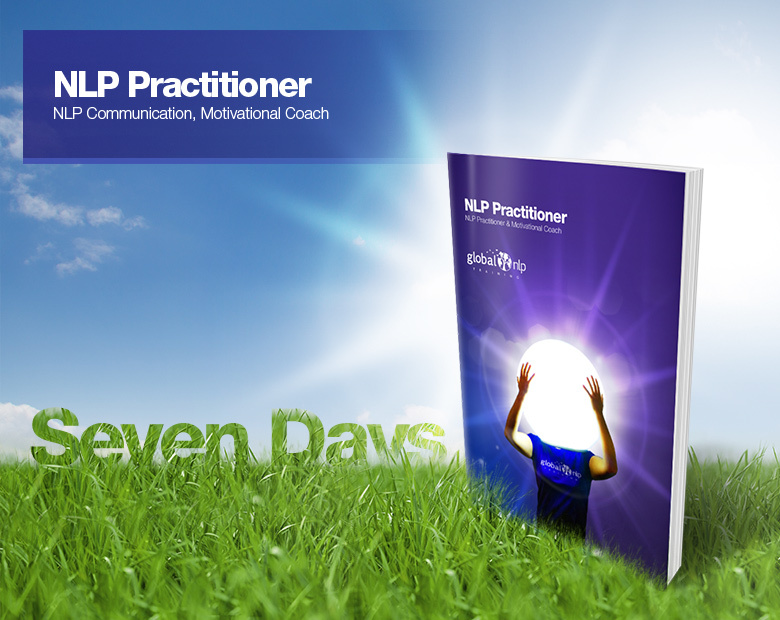 We are fully licensed by the Society of NLP, the only legitimate licensing body for NLP Practitioner, NLP Master Practitioner, NLP Communication and NLP Advanced Communication. 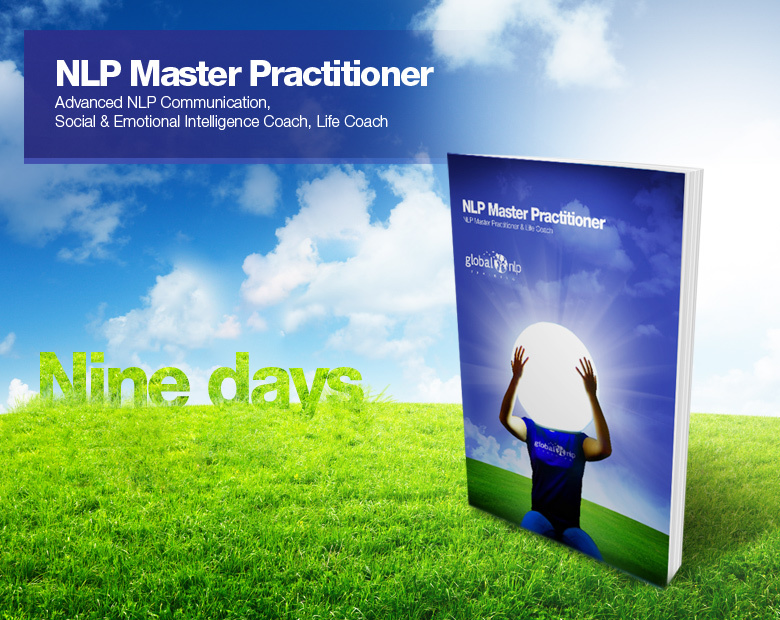 Our founder and trainer (from Amsterdam) is currently the top NLP Trainer of English language trainings in the Netherlands, is the only trainer operating globally, and is an active Social Edupreneur (running her company in a way that it also benefits the less fortunate.) 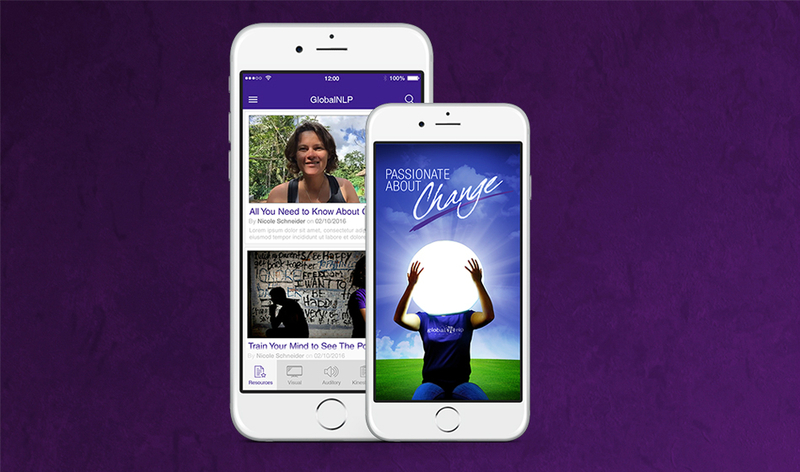 Her international team consists of heavy hitters in the (business) coaching, as well as in-company and non-profit training, industry. 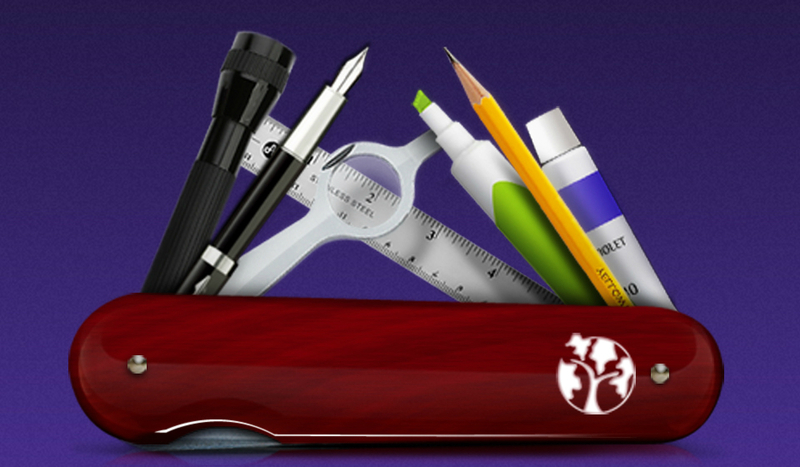 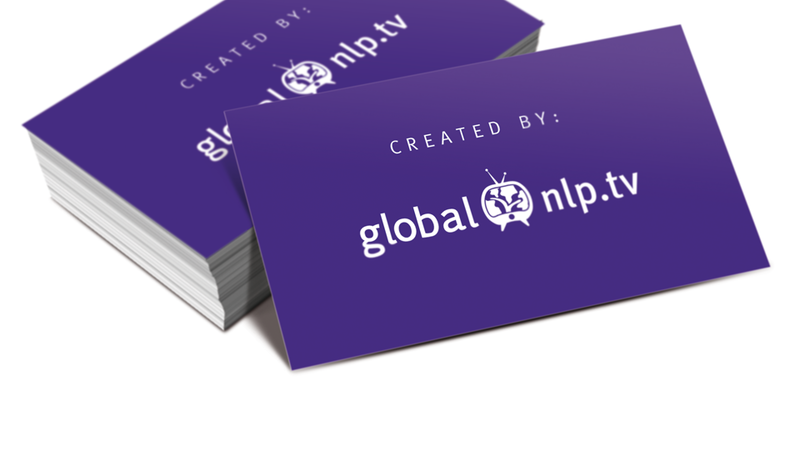 Global NLP Training offers the most extensive post-course support programs in the NLP training and coach training industry. 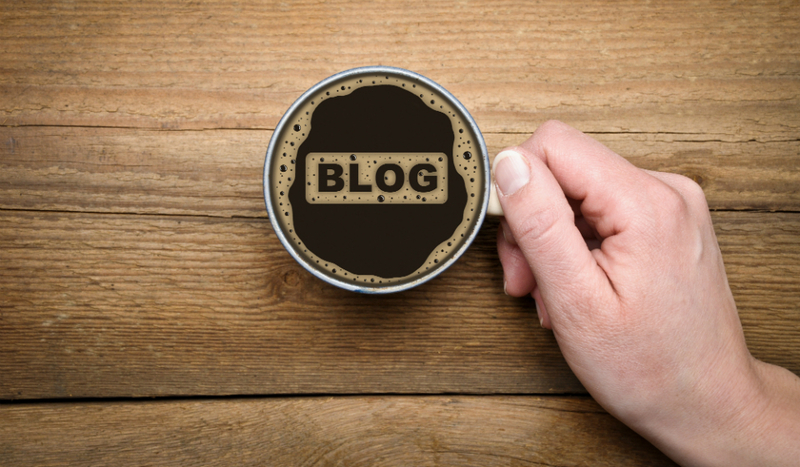 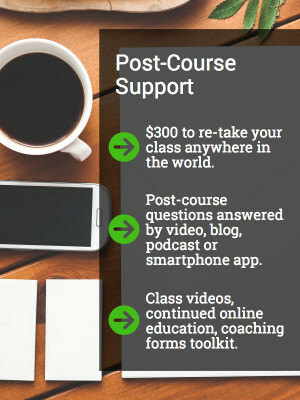 We answer former student questions via video & smartphone app, option to re-take the class at the cost of coffee, videos of previous trainings and much more.